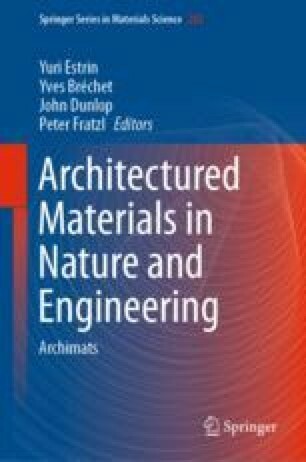 Architectured materials with negative Poisson’s ratio (auxetic materials) have been subject of interest for quite some time. The effect of negative Poisson’s ratio is achieved macroscopically through various types of microstructure made of conventional materials. There also exist (unstable) microstructures that, under certain boundary conditions, exhibit negative stiffness. In this chapter we review the microstructures that which generate macroscopic negative Poisson’s ratio and negative stiffness, determine their effective moduli and discuss general properties of the materials with such microstructures. We then consider hybrid materials consisting of conventional (positive Poisson’s ratio and positive moduli) matrix and randomly positioned inclusions having either negative Poisson’s ratio or a negative stiffness (one of the moduli being negative). We use the differential scheme of the self-consisting method to derive the effective moduli of such hybrids keeping in the framework of linear time-independent theory. We demonstrate that the inclusions of both types can, depending on their properties, either increase or decrease the effective moduli.